For years, the Venice Great Street was a model for how the city, council office and community could work together on a shared vision for the Mayor’s Great Streets Initiative. But while the outreach plan brought most of the Mar Vista Community together, the project was stalled because the segment of Venice Boulevard that would be a Great Street was owned by Caltrans, and the agency was concerned that protected bicycle lanes and wide sidewalks were not the correct treatment for this corridor. That obstacle was cleared earlier this year when Caltrans relinquished its hold on Venice Boulevard west of Culver City and Los Angeles wasted no time. 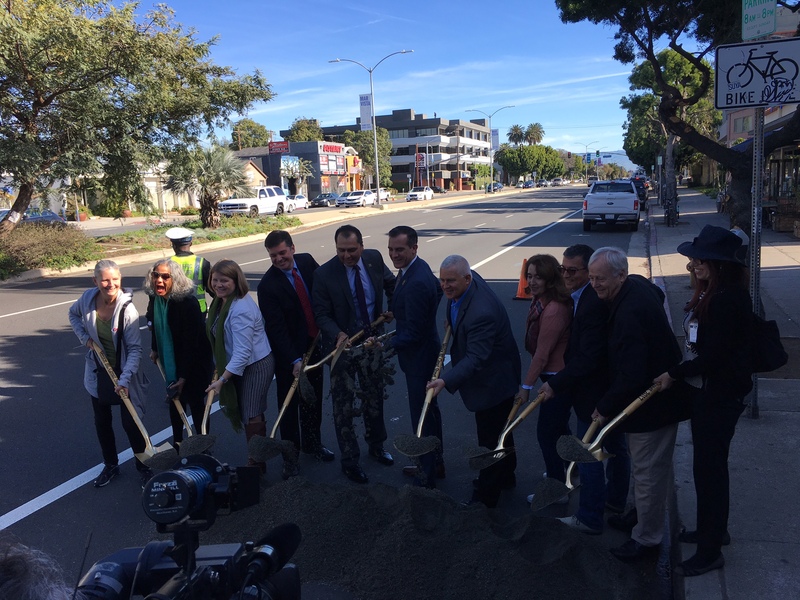 Earlier today, Mayor Eric Garcetti, Councilmember Mike Bonin, LADOT General Manager Seleta Reynolds and a host of leaders from the Mar Vista Community Council and Mar Vista Chamber of Commerce broke ground on the Venice Great Street. The Venice Boulevard Great Street aims to transform Venice Boulevard between Beethoven Street and Inglewood Boulevard from a car-centric street full of fast-moving traffic to one more friendly towards all road users. The goal for the project goes beyond improving safety and connectivity for road users. It will also create a “main street” feel for Venice Boulevard in the project area, a goal shared by the loal Chamber of Commerce who has worked closely with the council office on the Great Streets project. Photo : Sarah Auerswald, Mar Vista Chamber of Commerce and Mar Vista Community Council. For more information about the Great Streets Project in Mar Vista, please visit the project webpage at Mike Bonin’s website or the Great Streets webpage. The pedestrian friendly “improvements” along Venice Blvd. in Mar Vista as part of the “Great” Street Program are quite disappointing. I would have to believe that the project was supported by the new businesses along the area and bike proponents, but for locals who use this main thoroughfare on a daily basis via car, it is only a reason to cause us to zig-zag through neighboring residential areas where the risk of pedestrian injuries or causalities will be just as great, possibly even greater for children living in those households. I have to wonder if this project was designed by a traffic engineer sitting behind a desk and who doesn’t participate in the corridor. And then today, in researching this project (which I, a very local resident, knew nothing about), I see that there is already major high-rise, residential plans for the corridor (thanks for that, from those of us long-time Mar Vista residents whose lower rent apartments along the Blvd. are now at risk). And lastly, the design alone. Seriously? The white pylons? Anyone who has lived in a metropolitan area for any period of time, can tell you that those pylons will be knocked over causing road hazards and/or full of black markings and scrapes within months, resulting in quite the eyesore. Not to mention, center divides just to the east and west of this project are already growing waist-high weeds and looking quite shabby. Oh, and people attempting to parallel park along a busy, now two-lane corridor? This too will leave drivers running for the neighborhood side streets through residential alternatives. Going forward, please keep in mind that not all of us can bike everywhere. And I’m not even a grouchy old guy. Just someone highly disappointed in this money-driven (greed) project pushed by already rich new business owners. LOL on the “I’m not even a grouchy old guy” line!!! Oh my God! They have really messed up Venice Boulevard for the commuters that have to go back and forth to work everyday. You should see the design layout, it is appalling! Whose brainchild was this? The ignorance of this is beyond belief. Those who are for this absurdity must not have a regular job they go to everyday so they’re unaffected. And nobody walks in L.A.